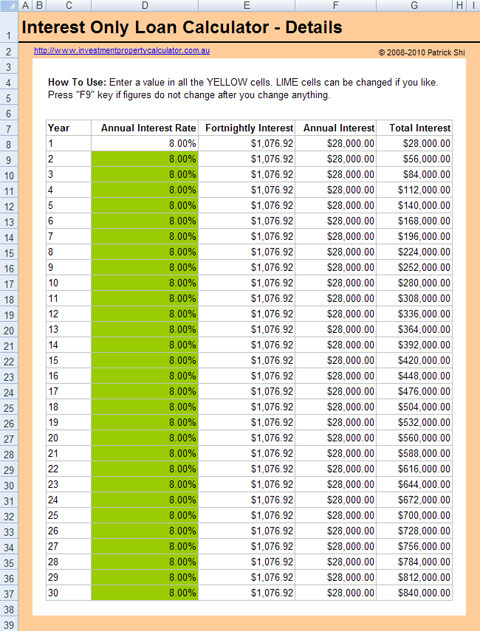 A simple calculator to work out monthly, annual, and total interest payment for an interest only loan. Interest only loans are very popular for property investors as it allows you to maximize your tax benefits in the first few years, especially if you buy a brand new property. This simple interest only mortgage calculator tells you monthly, fortnightly, or weekly interest payment of your interest only loan. It also shows the annual interest and total interest payment you are going to pay. Moreover, this calculator allows you to specify different interest rates throughout the loan term - it is very handy to work out your new repayment if there is an interest rate change. Here is a screen shot that will give you a better idea that what you need to do and what this free Interest Only Loan Calculator can tell you. 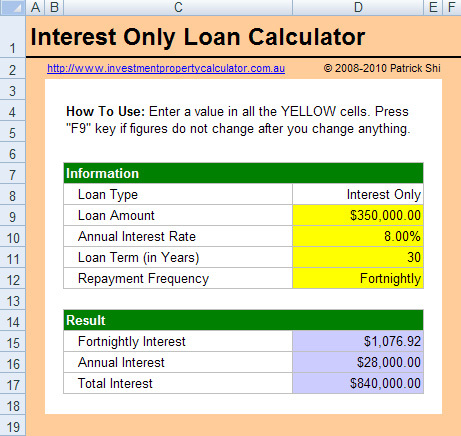 Download FREE Interest Only Loan Calculator Now!